Forget who will score first or who will get the first penalty – the big moment here is which coach will spaz out first? Both Avs coach Patrick Roy and our John Tortorella are fiery and animated, to say the least. Both could go off like firecrackers if this game gets chippy or a team gets one too many bad calls. So keep your eyes on the bench, people. This could be fun! I have no idea how it came to this, but apparently David Booth is the Canucks’ best player right now. Followed closely by the man who gave up his looks for us, Zack Kassian. Booth has scored 3 goals in his last two games which leaves me wondering if the other teams have written him off like Canucks fans have so they just don’t bother to pay attention to him much on the ice. Let’s hope the Avs haven’t been reviewing the game tapes from the last couple of Canucks wins and they still think he can only hit the back of a deer and not the back of the net. And since the above picture shows he’s got a bit of a history with the Avs, I predict a Gordie Howe Hat trick for Boothie tonight! The Canucks. The Canucks should care about this win very much. A win here – and a Phoenix Coyotes loss to Cory Schneider and the New Jersey Devils – inches them that much closer to almost getting a playoff spot. With only two wins in their last six games, the Avs are kind of slumping right now too so, yeah they’d love to stop that slide on us, but if they lose one more (this one) it’s not going to toss them right out of playoffs. They still have enough games to secure their spot (and their subsequent first round exit). 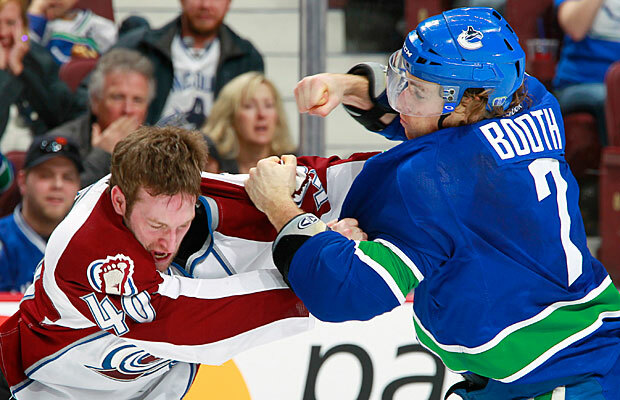 So really, Avs, you shouldn’t try too hard tonight. Take it easy and give us just a little more hope to be dashed later on. Thanking you in advance.